The Quantum III, microprocessor based, digital DC drive package offers a space saving design, many accessories, and arrives ready to install. Set-up is quick to configure with MentorSoft software or drive keypad. Quantum III drives meet industry standards for typical applications as winders, slitters, extruders, and plastics production. 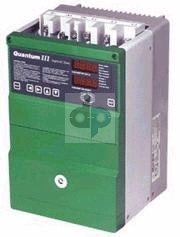 The Quantum III is available in three phase, AC supply voltages, ranging from 208-460 VAC, and supports motor power needs from 3-1000 hp, in regenerative and non-regen models. The added feature of 115 VAC control interface makes it the choice for users with space constraints. Expand your drives performance by integrating MentorSoft software, Network comm card, operator interface unit, remote I/O box, or field current regulators (FXM). Critical components kits are available to minimize down time in the event of a breakdown. Designed to fit within maintenance budget constraints, these pre-assembled kits can be a life saver. Quantum III powerful and compact drive technology make it your choice.